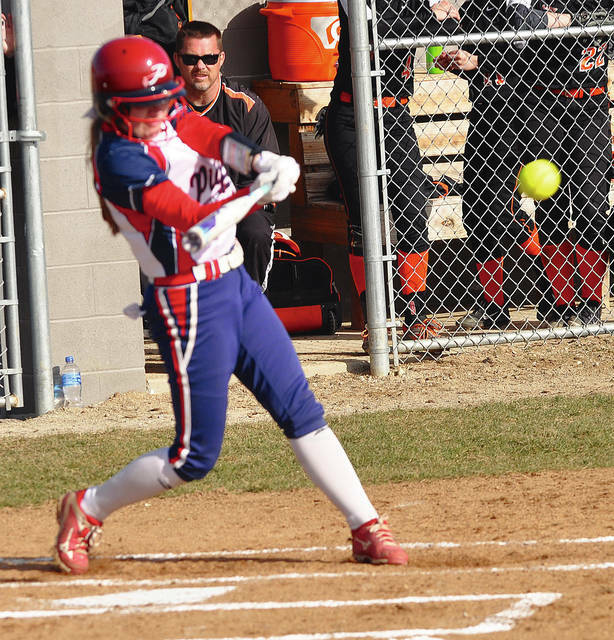 Rob Kiser|Call Photo Piqua’s Kathy Young drills a single against Arcanum Wednesday. Rob Kiser|Call Photo Paige Hinkle comes off third base and looks towards the plate as Arcanum third baseman Macey Hartman is ready to make a play. Rob Kiser|Call Photo Piqua shortstop Reagan Toopes looks to put a tag on Arcanum’s Camille Pohl on a steal attempt Wednesday. 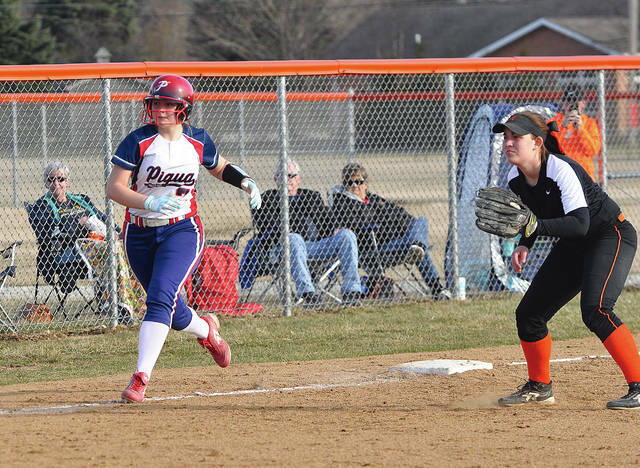 ARCANUM —- After an 8-1 win over Lehman Catholic Tuesday, the Piqua softball team knew the challenge would be stronger against Arcanum Wednesday. And the Trojans were exactly that, recording an 8-3 win over Piqua. Still Piqua was right in the game in the sixth inning, trailing 5-3 with a runner on third and two out when Arcanum first baseman Camille Pohl turned in the web gem of the game to that point. Piqua’s Paige Hinkle hit a shot ticketed for right field and Pohl made a diving catch to end the inning when it looked like it would be 5-4 with the tying run in scoring position. In the seventh, Arcanum second baseman Sydney Artz layed out to catch a blooper by Kathy Young to keep the Indians off the base paths. “They are really solid on defense,” Campbell said about Arcanum. Arcanum had scored in each of its first three at bats to open a 5-1 lead. In the first Peyton Garbig doubled and Gracie Garno singled. Kaylee Wilcox had a RBI single and Macy Hartman hit a fielder’s choice to make it 2-0. In the second, they added two more on a wild pitch and a double steal attempt, with Piqua cutting the runner down at third to end the inning. Hannah Anderson and Mariah Blankenship singled in the third for Piqua. After Hinkle reached on a fielder’s choice, Anderson scored when Hinkle went to second on a double steal. Arcanum answered in the home third when Wilcox doubled and scored on Pohl’s singled to make it 5-1. Piqua loaded the bases in the fifth with two outs, before Garbig relieved starter Macy Skelton to get a strikeout to end the rally. After Piqua got within 5-3, in the sixth, Arcanum came back with three runs to go up 8-3. Garbig had a RBI double and Garno and Pohl had RBI singles in a five-hit rally to put it out of reach. Skelton and Garbig combined on a six-hitter, striking out three walking four and hitting two batters. Piqua was schedule to host Urbana Thursday and Trotwood-Madison Friday. “We are hoping to cruise through this week at 3-1 and get some warmer weather,” Campbell said. After falling to a strong Arcanum team Wednesday. https://www.dailycall.com/wp-content/uploads/sites/30/2019/03/web1_kylie-2.jpgRob Kiser|Call Photo Piqua’s Kathy Young drills a single against Arcanum Wednesday. https://www.dailycall.com/wp-content/uploads/sites/30/2019/03/web1_paige-2.jpgRob Kiser|Call Photo Paige Hinkle comes off third base and looks towards the plate as Arcanum third baseman Macey Hartman is ready to make a play. 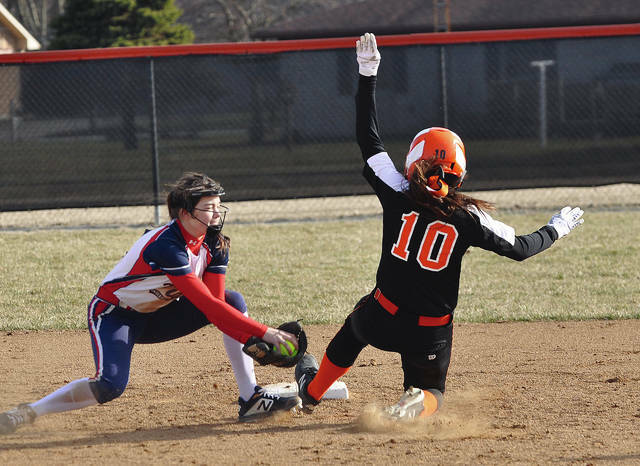 https://www.dailycall.com/wp-content/uploads/sites/30/2019/03/web1_reagan-2.jpgRob Kiser|Call Photo Piqua shortstop Reagan Toopes looks to put a tag on Arcanum’s Camille Pohl on a steal attempt Wednesday.